And hey, if you love simple recipes like this you might also enjoy my book, Little House Living: The Make Your Own Guide to a Frugal, Simple, Self Sufficient Life. It’s filled with over 130 mix and DIY recipes that are easy and from scratch! If you are looking for a true essential oil to use in this recipe that would have the same notes of vanilla, I would recommend Balsam of Peru Oil. It has a wonderful woody, vanilla-like scent that would be perfect for lip balm. So here’s all you need to make a batch of at least 10-12 lip balms depending on the size of the containers you have to put them in. Use a saucepan just for making body products like this, not one of your regular cooking saucepans. The beeswax is nearly impossible to clean out so I just use a pan I picked up at the thrift store. –Want to make gloss instead of balm? Here’s my recipe for Homemade Lip Gloss. Step Three: Use an eye dropper (or an old clean medicine dispenser will work) while the liquid is still hot and fill your containers. If it starts to cool before you finish just heat it back up to the liquid state. You may want to place your tubes on parchment paper before you add the liquid for easy cleanup. This batch makes about 10-12 small containers or tubes. I purchase my empty containers on Amazon. (And they are reusable of course so they pay for themselves many times over!) I’ve used both the standard lip balm tubes and the little plastic “pots”. Either will work great! Set the tubes/pots aside once they have been filled and let them cool without being disturbed. 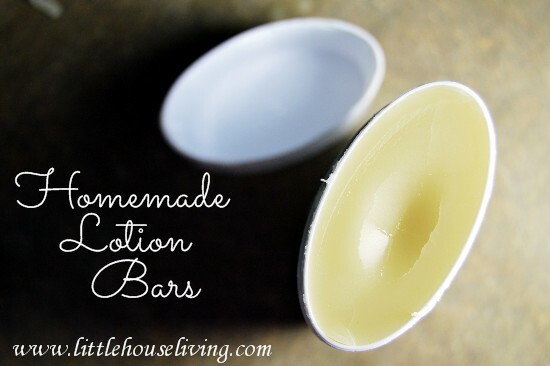 Add Cocoa Butter instead of Shea Butter for a “chocolate” scented lip balm! Looking for some other fun DIY projects to try? You might love my Homemade Vaseline, Coconut Oil Lotion, Cinnamon Vanilla Bean Body Scrub, or another project on our Make Your Own page. Looking for more fun DIY projects that you can make quickly and easily? 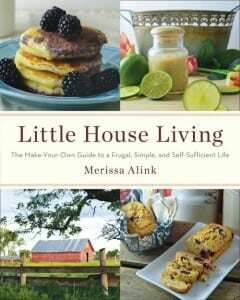 My book, Little House Living: The Make Your Own Guide to a Frugal, Simple, and Self Sufficient Life has over 130 recipes just like this one! 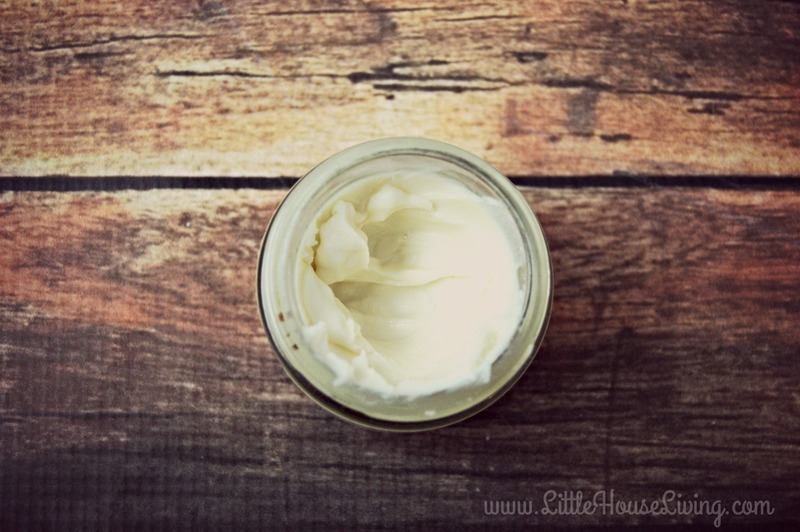 Have you ever made your own recipe for homemade Lip Balm? How did it turn out? What flavors do you like to add? This blog post has been updated as of December 2018. Having allergies must be the mother of all invention! 🙂 They sure make finding all sorts of items a pain, and reading labels a new past-time… Cool ideas. Im allergic to coconut. What can I use instead?? Well, if we all had Pure Organic diets, allergies would mostly be a thing of the past. I’ve never in my entire life, except in the last 10-25 yrs., heard of So Many people getting allergies!!! its because of a lot more artificial substances in our life; via furniture etc etc!! I’ve been getting chapped lips this summer! I think I lick my lips when I’m in the pool or when outside working… sweating, you know? So…you get the vanilla essential oils from amazon. I’m guess the little jars too? where does one buy beeswax or shea butter? Do you have to buy them online or are these items carried in stores? I added the links in the post above to Amazon where I got my ingredients. And yes, I also purchased the jars on Amazon. You can buy beeswax locally most of the time….if you can find local honey then chances are you can also get bees wax there. 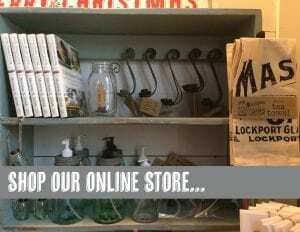 Mountainroseherbs.com sells all kinds of glass containers, herbs, essentials oils, teas. Just basically natural stuff. I use them for herbs and sometimes henna for my hair. I believe they carry lip balm containers. I found a local place here in silverdale wa called steadman’s I bought 1 1/2 pound block of beeswax and tried 8 different flavors of honey was fun for my kids and I bought some blackberry honey as well. Check michaels for containers as well. I love amazon. I have most of my stuff to make things now just have to buy pan at dollar store to melt stuff in and start making gifts. did this same balm last winter – those little jars work well. It’s so easy and fun! I love making it! This sounds great! It would make lovely gifts, and my girls would enjoy it, too! Thanks for all of your great tips. Yes, it’s a frustrating little uncommon allergy isn’t it? Seems like it’s that way for many allergies! For some reason I’ve found that people find the corn and carrot allergies hardest to believe, but I’m not sure why! I just tried this recipe last night, and love it. The lip balm is truly the best stuff I’ve ever tried. Perfect consistency and moisture level. I used peppermint oil instead of vanilla as the beeswax & shea butter have a fairly strong scent that I wanted to cover up a little. But it was really quick and easy to do. Grating the beeswax was the hardest step…pastilles next time! The recipe is simple and easily adjustable. 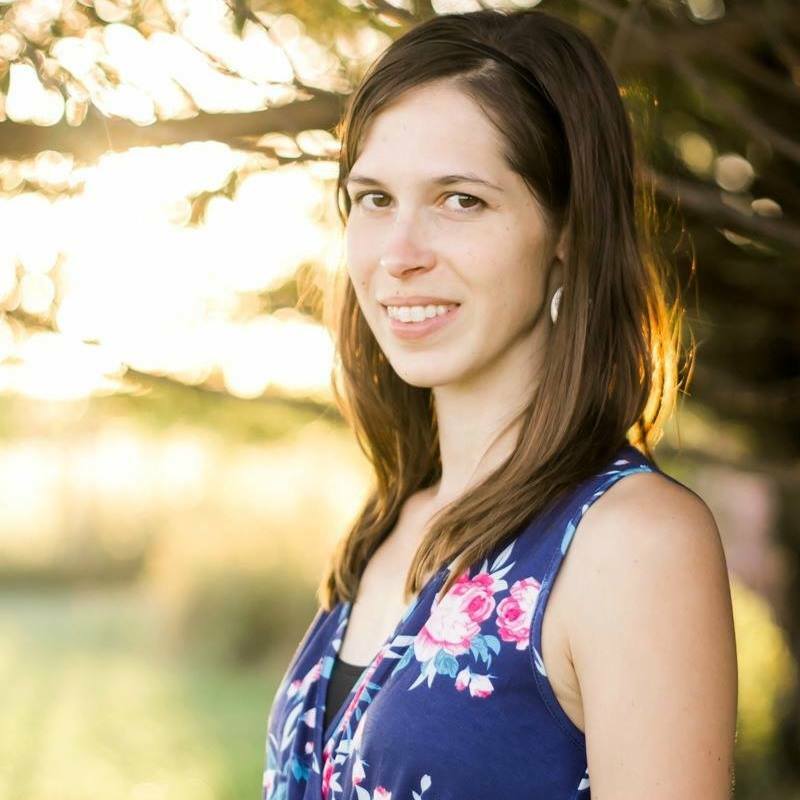 I’m so glad I found you Merissa – yeah for Pinterest! Instead of the vanilla essential oil do you think you could use a vanilla bean in the melting process? You could try it, I’m not sure how it would work! It does not infuse as well if you do it during the process but you can infuse it into just the oil over low heat for 3 hours. Is the shea butter absolutely necessary? Would just beeswax and coconut oil suffice? I have plenty of those two ingredients and was wondering if I could just substitute the shea with extra coconut. Thanks! I haven’t made it that way before but you can sure try it and tell us how it comes out! You can easily make this without Shea butter, just use more coconut butter. I start with a 4:1 ratio of coconut butter to beeswax (4 T coconut oil to 1 T beeswax). This makes a soft balm, but still firm enough for use in a tube. You can also increase the wax for more firmness and lasting power. The more beeswax, the longer it will last on the lips. Also try less, the balm becomes more like a healing salve. I have use 12:1 ratio of cocnut oil to beeswax to make a substitute for vasolene. You could also substitute cocoa butter for the Shea butter which increases the smoothness and emollient power. 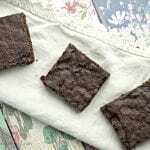 It imparts a wonderful chocolate small, and mixes well with orange essential oil. Just add about the same as the beeswax and gradually crease as desired. sharing! I have had my eye on beeswax and now I will buy some cause I love coconut oil too! I love making my own products as well! I bought that same vanilla oil from amazon and have had so much trouble with it…it all tends to settle in the middle bottom of the lip balm. I have used a few other oils from them and have had no problem. I think maybe I’ll use some pure vanilla extract the next time. i have cocoa butter, do you think i could use it instead of shea butter? You could try it, I think it would work! I use the cocoa butter and it works great. Plus the chocolate scent in the house with the honey scent from the bees wax is amazing! You had mentioned using around 12 drops of Vanilla Essential Oil. So in your opinion would you consider the vanilla smell afterwards to be more light, or heavier? I love scented chap sticks but most I find give off very little scent. I’ve read on several sites to “just add the essential oil to your liking” so I guess my 2nd question would be does it smell the same while you are making it as it does once it’s solidifies? Thanks!!! In this recipe the vanilla scent was still very light. It does not smell as strong as it solidifies. I would love to try this, but I am sensitive to coconut oil. Any ideas for a substitute? Maybe try adding cocoa butter instead? I too am allergic to cocomotoprophynl betane – made from coconut oil so am wondering the same? I love how the coconut oilk feels on my skin – unti the reactions begin. I am going to try to experiment. Now the next challenge is to find a suppliet that doesn’t charge an arm and a leg to ship to Alaska!!! Thanks for your site…I LOVE it! Oh wow! I love lip balm! I am going to try this out! I will let you know how I do! Hi, I would really love to use this recipe, but I am severely allergic to coconut oil, and I was just wondering if there were any other alternatives you know of that would produce the same result… thanks so much! I’ve used olive and apricot oils and they both worked really well. Hi! I’ve really enjoyed your homemade recipes…thank you! I have tried two other lip balm recipes and because I live in the hot desert…have been frustrated that they turn liquid if I don’t keep them in the fridge. That does not work if I’m trying to make a balm to keep in my purse! They even turn to liquid just at room temperature! Before I try this recipe, do you know if it will stay solid at 70 degrees or so? I’ve wondered if that problem could be solved by just adding more beeswax, but I’ve not done this making of beauty products enough to know if that would work. I have lip tubes to fill rather than small jars. Could you offer any suggestions? Thanks so much! It won’t stay solid because coconut oil’s melting point in somewhere in the upper 70’s. You could try adding more beeswax and you can also use tubes, that’s what I used last time to make these with good success. You could add another Tablespoon and see how it is. I made a batch and used chapstick tubes. I ended up with 20 tubes! I made some lemon, some orange, some peppermint and some lemon-peppermint! What an awesome recipe, Merissa! Thank you so much for sharing. If I bag them and put them in the fridge, how long is the shelf-life? I found a box of 25 of the little clear containers at Joann’s for $10 and I used a 50% off coupon – $5. They are in the jewelry making department. Etsy.com has heart, star and daisy shaped clear containers. They are adorable. I live in the desert, too! I haven’t tried this recipe, but I have found that beeswax mixed with coconut oil will stay solid even in warmer climates. 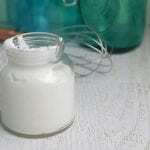 Vanilla essential oil is a water soluble EO. Other oils may work better because they are fat soluble (which all the ingredients are fats). This would explain why many people have said it doesn’t mix in well– you know what they say about oil and water! Thank you for this recipe! Instead of vanilla EO, I used peppermint. It is wonderful!!! The recipe is so easy, I made the lip balm while my supper was cooking. My lips had cracked due to a cold and I put some lip balm on before I went to bed and when I woke up the next morning, my lips were healed up. I am handing them out as Christmas happy’s! Just remember, if you sub an oil, you’ll get a different product, because each oil/butter has different properties and shelf life. Maybe try sesame in place of coconut, but you’d need a bit more shea or beeswax because it is a bit softer. Can you melt in the microwave? Or in a double boiler? I wouldn’t do it in the microwave but a double boiler would work. I’ve made the lip balm and also some lotion bars and both worked but were oily. How do I get away from that? They are always going to have some oily properties because of the coconut oil in them. You could add more beeswax but the oil won’t go away completely. Can’t wait to make this lip balm with my kids! 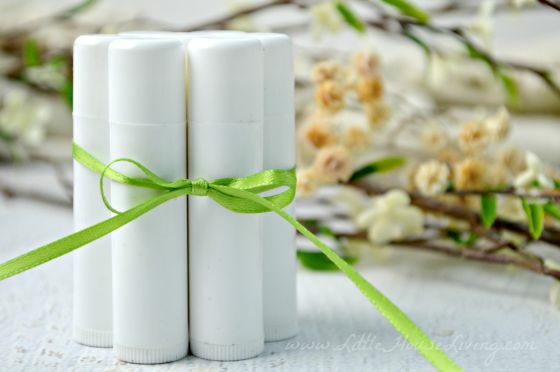 Four daughters who go through a lot of lip balm, it would be great to make it ourselves. Found this recipe for your lip balm on Pinterest, and tried a reduced version. Cut everything in half. I didn’t have vanilla essential oil so I used vanilla extract and even added ground Cardamom . My lips feel luscious and smell wonderful! This is my first winter in Washington State and my dry chapped lips are giving me the fits. Hoping this keeps the chapping away. Thanks!! this looks easy enough that I could probably even do it! Thank you! Approx how many of the containers does this recipe make? I would love to make a batch for friends. It depends on the size of containers used. I made this is little lip balm pots and it made about 8. I’m really excited to try this recipe!! I want to start using essential oils, but I’m having a hard time deciding on which ones to buy! Young Living, Do Terra, etc… Can you tell me a little bit about Edens Garden? I’ve never heard of them. Thank you! I’ve really only bought the Vanilla Oil from them so I’m not sure about their other products, sorry! I usually use a brand called Nature’s Alchemy. I buy from Plant Therapy and Mountain Rose Herbs. Very happy with both. I just made a batch and used 2 TBS grated beeswax, 1 TBS each cocoa butter, Shea butter, 2 TBS coconut oil and 14 drops peppermint EO. Yummy. I’m not much of a balm or lipstick gal but my lips are painfully chapped. The peppermint oil kind of gives it a cooling sensation. I just made these. All I can say is thank you! They are awesome! For some that don’t know I melted my Shea Butter first then let it refirm up then remelted it into my batch it makes a smoother finished product. Thanks again! I use a simple recipe because my daughter is allergic to petroleum products including food coloring. To infuse the oil I scrape the pods into the oil and heat on low for 3 hours or let set for 3 weeks. 2T olive oil infused with vanilla bean. I heat them together in the micro til they are liquid and pour them into containers. I also am allergic to all petroleum products. My doctor recommended I only use pure lanolin and it has been a godsend. I would love to be able to use this in a better form than straight out of the jar, as it is a little sticky and not a great smell. Any suggestions? I hope you enjoy it when you try it Theresa! Awesome! I go through Chapstick like crazy! This should save me some $$ and they would be great gifts too! Thanks for sharing on Tips and Tricks! Crazy question but could I use homemade vanilla extract? I have no vanilla oil . I know I could purchase some but I’d have to wait for a better time to purchase it. Thanks. You should be able to but keep in mind that most vanilla extract is made with alcohol so it can have a drying effect. I used chapstick containers, as it was what I had on hand at the time. Does anyone know where I can purchase labels for these? I made four varieties and don’t want to get them mixed up when I give them out to family and friends. Thanks! We just get the sticky labels (like for packages) and print a pretty label from the computer that we wrap around the tubes. They make some rectangular labels that are just the perfect size for these! I believe we found them at an office supply store. How long does the lip balm last? At least one year if stored in a cool, dry place. 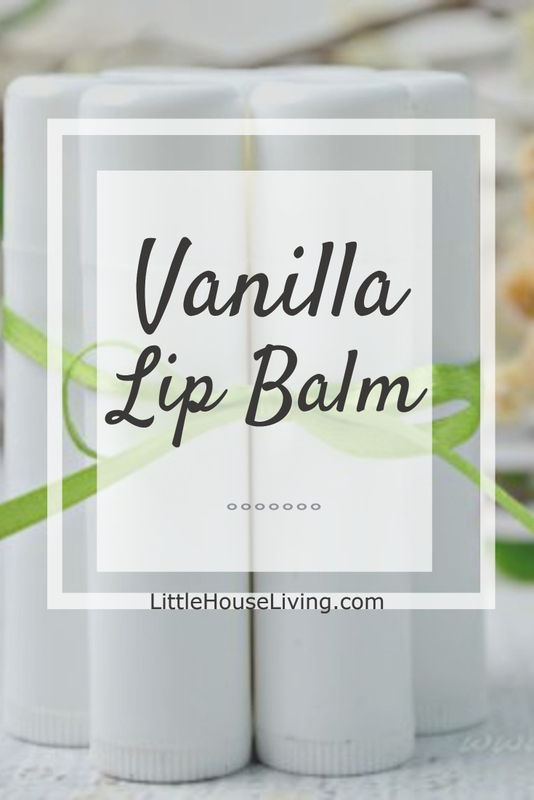 Does the recipe for the vanilla lip balm only make one lip balm? This recipe makes at least 10 lip balms. 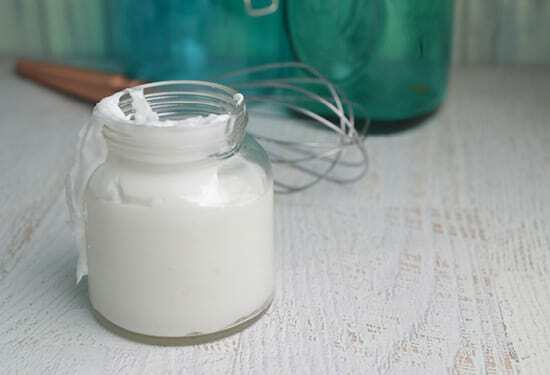 Can I use regular vanilla that I bake with or does it have to be essential oils? 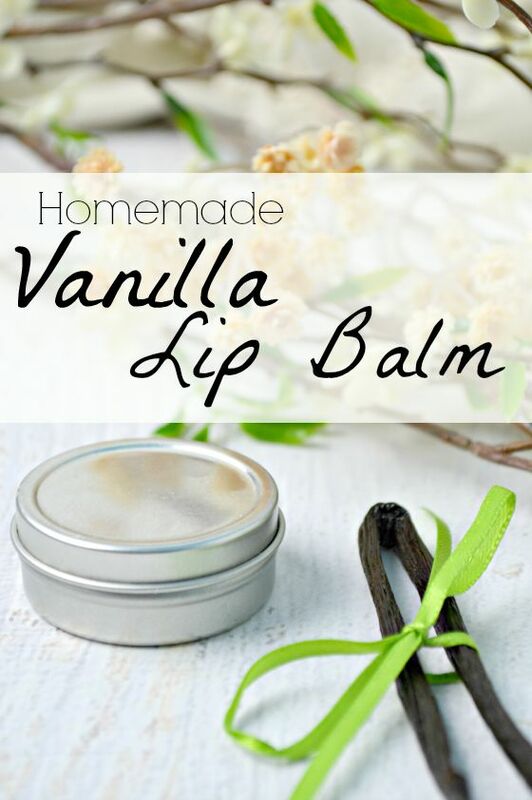 Regular vanilla won’t blend in as well and it also contains alcohol which can be drying to lips. You could use vanilla bean paste and try to blend it in to the mixture (although that may leave some pieces) or you can leave it our entirely too. Im allergic to the shea butter. Is there anything else I can use instead? You could try cocoa butter if you are able to use that instead. You may want to add a bit more beeswax though since cocoa butter will melt easier. can you use mango butter instead of coconut oil? I haven’t tried it personally but I think it would work. i made mine in a double boiler and once melted added 2tbsp of tea leaves, let sit for 15 minutes and then strained it. The strawberry rhubarb blend from David’s tea turned out amazingly! 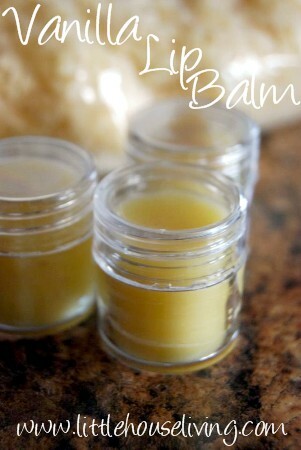 A few drops of castor oil added to your favorite lip balm recipe is amazing. Gives a little bit of gloss and really makes the balm last longer on your lips. We recently retired after running a soap and skin care company and those balms literally flew off the shelves. hi i wanted to know what ratio to use if using bees wax, almond oil, and shea butter. I want them to stay hard in the pot if i take them with me. also which vanilla will work the best? hello is it tablespoon or teaspoon for shea butter?? I have friends who are severely allergic to bees. What could I use instead of bees wax? Just so you know. The link to amazon with the tubes is not working. Thank you for this recipe, it’s the best lip balm ever. I love making it with lime essential oil. Is this a smooth lip balm that really glides across your lips, or is it more of a waxy balm? This is a smooth balm. This may be a silly question, but is the coconut oil that you use in your homemade products the naturally scented or the unscented? I like coconut oil, but don’t fancy the smell when the scented stuff is heated. I used to use the scented on my body when I got out of the shower, let it dry before dressing, but when I sweat it would leave a terrible smell on my clothes (worse than sweat) that I was unable to launder out. I use both. In this particular recipe, I usually use the extra virgin coconut oil (scented) but I have made it both ways. I buy mine from Amazon here.